Is your credit history less than perfect? Don’t feel bad – you’re in the majority. Recent statistics revealed that 56% of Americans have subprime, or bad, credit.If you’re one of them, it doesn’t mean you have to give up on your dream of owning an RV. You can still buy an RV with bad credit if you plan ahead, do your homework, and rethink your spending habits. Check your credit score.You can get a free copy of your report from each of the three nationwide reporting agencies every 12 months from annualcreditreport.com. Or you can contact the credit bureaus individually: Equifax Credit Information Services: 1-800-685-1111, Experian: 1-888-397-3742, TransUnion Corporation: 1-800-916-8800. It’s important to check your report from all three bureaus because mortgage lenders usually pull credit scores based on each of these reports and base your rate on the median score. Errors on just one report can affect your interest rate – and your monthly payment – even if the other two reports are accurate. Although disputes are generally resolved within 30 to 60 days, the process can take longer if you have to mail documents back and forth. Pay your bills on time. It may seem like a no-brainer, but it’s easy to forget or be late on a payment here or there. Even one missed or late payment can negatively impact your credit score, not to mention you can get hit with a late fee. Mark exactly when your bills are due on a calendar and get in the habit of checking it daily. Want to brush up on your “tech-spertise?” This is a great opportunity to start. There are many free calendar and reminder apps for your phone, notepad, or computer that can help keep you on track. Still not sure you can keep track of your bills? Look into automatic bill payment services from your bank or credit union and your utilities and other lenders. Most are free and can make paying bills (almost) effortless. Pay down your existing credit bills. A little extra money can go a long way when it comes to paying down your credit. That’s because the money you put toward your payment beyond the minimum required goes toward the principle, not just the interest. The sooner you pay off your principle, the less you’ll end up paying in interest. When it comes to a large loan, such as a mortgage, this technique can literally save you thousands of dollars. Not only that, it looks good on your credit history. Start saving for a down payment. No one said turning your credit history around is going to be easy, and saving money for your down payment when you’re trying to pay your bills can seem downright difficult. But the more cash you have upfront, the better chance of getting approved for a loan, and the better your loan rate will be. Try to put away a little bit every paycheck and watch it add up over time. Expecting an income tax refund? Add it to your RV down payment for an extra financial boost. Don’t open or even apply for any credit cards. Lenders look at “credit inquiries,” which show that other lenders have asked for your credit record and indicates that you might be about to take on new debt. Don’t close any credit card accounts, either. You may be surprised to learn that you shouldn’t close any credit cards during this period, either. Almost 30% of your FICO credit score, the one most lenders rely on, is based on the amounts you owe, including how much of your available credit you’ve used (called your “credit utilization ratio”). If you close a card that has a high credit limit but keep your balance the same on your other cards, it will look as if like maxing out your available credit, which can hurt your score. Crack down on your credit spending. If you haven’t already, start paying down your card balances, with the goal of getting to a zero balance. If you have to add new charges, keep them to 10% or less of your available credit, whether or not you pay off your credit card bill in full every month. Start shopping around for a loan. Unfortunately, a bad credit history probably means you’ll end up paying more for a loan than you would if you had excellent credit. But that’s just more reason to shop around. Look at local lenders, RV dealerships, banks, and credit unions as well as online sources to get an idea of what’s available. Once you do start shopping for a loan, keep your loan inquiries within a within a 14-day span. Multiple credit inquiries over a longer period of time could negatively reflect on your FICO score because it appears you may actually be taking out multiple loans. If you submit all your applications within a two-week span, it will most likely show up on your credit history as applications toward a single loan. Take a close look at what you can really afford. Think about your RV “needs” vs. “wants” – don’t fall in love with upgrades. When you’re focused on your monthly budget, it’s a good time to decide what’s really important in your RV and what you’re willing to live without. If, for example, you qualify for a $20,000 loan, it doesn’t necessarily mean you should max it out on your RV. If you scale back and purchase a less expensive model, you’ll free up money you could use for gas, insurance, or other bills. Consider refinancing a high-rate loan.If you’re stuck with a high-rate loan, think about refinancing – not immediately, of course, but in 12 months, or whenever your credit score goes back up. Talk to your lender to find out what your options are. Want more information? 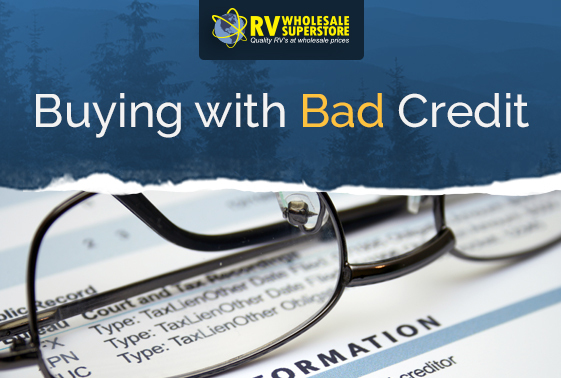 Download this tip sheet from RV Wholesale Superstore on how to combat bad credit!